Be the first to share your favorite memory, photo or story of Clayton . This memorial page is dedicated for family, friends and future generations to celebrate the life of their loved one. 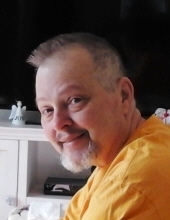 WINSTED – Clayton L. Warren, 62, passed away peacefully on Saturday, March 23, 2019. He was the loving husband of Elizabeth O’Key-Warren for 10 years this May 2nd. Born July 21, 1956 in West Shokan, NY; the son of Francis Warren and the late Erika (Krause) Warren. Clayton was a very gentle spirit with a kind heart and soul. He enjoyed growing up near the reservoir in West Hurley, NY with his beloved grandparents. He loved fishing and animals. He also loved motorcycles, watching races, smooth jazz and a good cup of coffee. He enjoyed living at the Cape and especially watching boats from the dock at Seagull Beach. He was an amazing husband and the greatest blessing in Elizabeth’s life. He will be deeply missed. In addition to his devoted wife, he is survived by a sister, Lynda Barg and husband Paul of NY; five sisters-in-law, Kathy Williamson and husband John of IN, Margaret Sievel and husband Bill, Maria and husband Craig Nelson and Rose Puzinski and husband Ray, all of Torrington and Mary Skorka and husband Frank of NJ; and several nieces and nephews. He also leaves his two beloved dogs, Sam and Thoden. A Memorial service will be held on Saturday, April 6, 2019 at Montano-Shea Funeral Home, 5 Steele Road, New Hartford at 1 PM. Visit an online guestbook at Montano-shea.com. To plant a tree in memory of Clayton L. Warren, please visit our Tribute Store. "Email Address" would like to share the life celebration of Clayton L. Warren. Click on the "link" to go to share a favorite memory or leave a condolence message for the family.